One of my favorite ways to blow off steam is to gorge myself on Thai food. If I had a rough day, I’d get some wine and order takeout from my favorite thai place. A nice pour of wine and a plate of thai curry, rice, spicy vegetables and satay always made me feel better and recharged my batteries for the next day. In Beijing, I turned on my coworkers to the same stress release method. If any one of us was having a hard day, I’d suggest a stop off at our favorite thai place for lunch. The waitstaff soon began recognizing us and giving us a special table. They even began to take notice of our favorite dishes: spicy green beans, yellow curry, pork neck, eggplant and chili mushrooms. Now, when I ordered the chili mushrooms, the majority of them would remain untouched on the plate and packaged off in plastic containers for later. This wasn’t because I didn’t like them. It was simply because I LOVED (or maybe COVETED) them and wanted them all to myself for later. The method to my madness was that I would take them home and put them in an omelette, alongside a helping of rice, for a quick and delicious dinner. To this day, I still do the same thing, the only difference is that now I can no longer order takeout. Instead I am forced to make my own chili mushrooms from scratch. But it’s no big deal to make them myself: they can be easily made in a short amount of time and I no longer have to fight off fellow table diners for what is rightfully mine. It’s simple, I just have one request: ALL THE THAI CHILI MUSHROOMS!! In a wok or large frying pan, heat 1-2 tbsp of oil over medium/medium-high heat. Add shallots and garlic and stir fry for a minute or so until mixture becomes fragrant. Add sliced mushrooms and stir fry until mushrooms are cooked and slightly browned. Turn off heat and add a handful of torn thai basil leaves, fish sauce and sugar. Stir to combine, cover and let rest for 1-2 minutes. Crack eggs into a mixing bowl. Finely grate ginger and garlic and add to egg mixture along with a pinch of salt and red chile flakes (optional). Whisk together until mixture is one consistency (yolks and whites are properly mixed together). In a non-stick frying pan, add 1 tbsp of oil and heat on high flame. When oil is HOT, add half of the egg mixture and fry. In a wok or large frying pan, heat 1-2 tbsp of oil over medium/medium-high heat. Add shallots and garlic and stir fry for a minute or so until mixture becomes fragrant. Add sliced mushrooms and stir fry until mushrooms are cooked and slightly browned. Add Thai chili paste and coconut milk and cook for a minute or so until mixture is thoroughly combined and bubbly. Turn off heat and add a handful of torn Thai basil leaves, fish sauce and sugar. Stir to combine, cover and let rest for 1-2 minutes. Crack eggs into a mixing bowl. Finely grate ginger and garlic and add to egg mixture along with a pinch of salt and red chili flakes (optional). Whisk together until mixture is one consistency (yolks and whites are properly mixed together). In a non-stick frying pan, add 1 tbsp of oil and heat on high flame. When oil is HOT, add half of the egg mixture and fry. Turn heat down to low and cover omelette for 30 sec or until top of omelette is cooked. 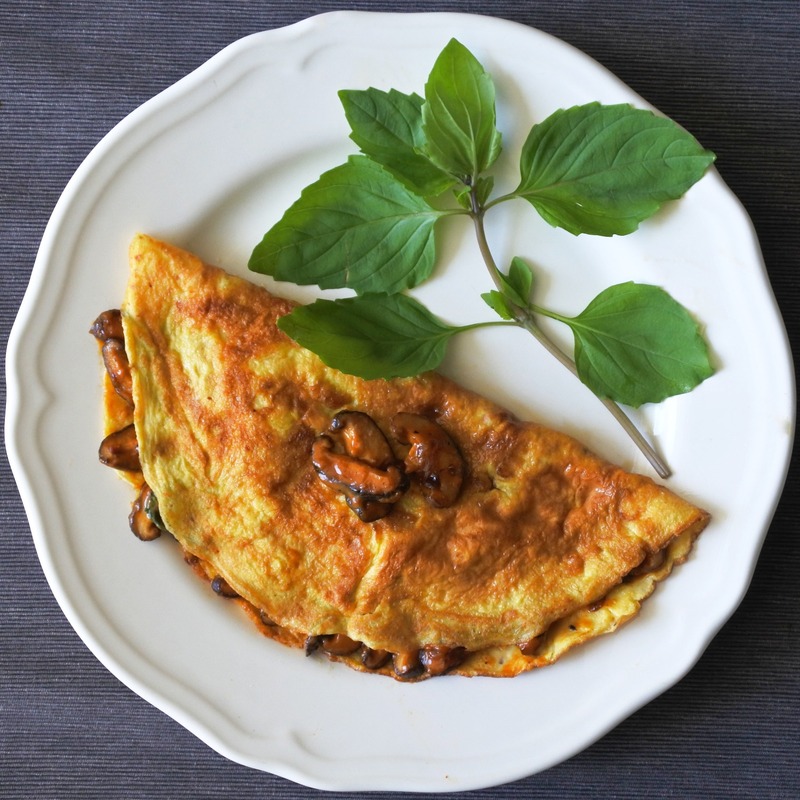 Add mushroom mixture to center of omelette, fold over and carefully transfer to a plate. Repeat steps for an additional omelette. Serve with a side of jasmine rice and Thai chili sauce. Enjoy!